Are you looking for great music and entertainment for your beach wedding ceremony, reception, corporate event, convention or party? Do you want entertainers who create excitement and a happy mood with music that’s great for any age? Call RythmTrail Caribbean Steel Drum Band! RythmTrail is the most unique and highly sought-after Caribbean steel drum band in Florida, because each member of RythmTrail are actual Caribbean Island natives, with more than 20 years of playing experience. With just a few simple beats, RythmTrail can transport you to paradise. RythmTrail Caribbean Steel Drum Band plays at more than 300 events annually in Florida and around the nation. Contact RythmTrail today to discuss your event and needs by calling 866-495-4522! You can also request a quote online at your convenience. They’ll make your next occasion an unforgettable island experience. RythmTrail made our Wedding Reception a CELEBRATION!!! My fiancé( now husband) and I were looking for a laid back, fun gathering of family and friends to serve as our first “Family Reunion” and Ephraim and the band were a perfect touch to a perfect day even allowing two of our quests to “play” the drums. I will definitely be looking for the opportunity to have RythmTrail at our next gathering. I'm very please with the steel drums at my beach wedding ceremony last month, it was exactly what I wanted, I fell in love with steel drums on a cruise to the Bahamas and always wanted it at my wedding. Thanks for the wonderful music on such short notice. Wonderful steel drums at my wedding ceremony and cocktail hour. The guests loved it. Thanks!! The guys were outstanding! They showed up on time, were very professional, and performed remarkably. They made our wedding a memorable one. I would recommend them to anyone. Thank you for everything. Thank you for doing such an incredible job at my sister's wedding this weekend at Honeymoon Island. The music was fantastic, and it was great that they could do their first dance right there on the beach. We were all thrilled with the music and will highly recommend you guys whenever we can! Thank you for the wonderful service at Kristen's & Rick's wedding last weekend. We love working with you!!! We were very happy that you could be a part of our special day! The drums added just the right touch to our wedding and everyone remarked what a nice suprise it was to have you there. Thanks again! Thank you so much for adding that special touch to our sunset renewal ceremony. Everything was perfect and just as requested. The music was wonderful and everyone enjoyed it. We are still in a daze and it was so much to take in at one time. My husband did not know the songs I had requested, but while taking everything in he noticed each song you played for the ceremony and he was very impressed and emotional. What I did not share with you was each song I requested for our renewal ceremony was actually played in our wedding as well; so you could imagine how special and touching it was for us to have you present and replicating those songs in a Caribbean style beach ceremony. We could not have asked for a more perfect atmosphere to display your talents and celebrate the renewal of our love and commitment. As you could tell, it was a pleasure to finally meet you and speak to you personally. I was glad the other vendors were able to meet you and enjoy your talent as well. I hope they spread the word! Thank you for everything! Our steel drum player was awesome! Everyone loved the music that the steel drum player was performing. Thanks for making our wedding day extra special! We would like to say a 'big' thank you for coming out and playing your steel drums at our wedding. Everyone who came loved the steel band sound, it really made our day different to others. I would definitely recommend you to others. Thank you so much for providing such a fabulous atmosphere for my daughter’s wedding in Orange Beach, Alabama. Everyone had a great time and enjoyed your beautiful music! Aside from your obvious talent, I was most impressed by your professionalism and attention to detail. You arrived on time and had everything in order so that I could focus on watching my beautiful daughter walk down the aisle. I would highly recommend anyone looking for a laid-back and fun evening to call you! Thanks again for making our special night so perfect! RythmTrail Steel Drum Band was a wonderful addition to our April wedding. We used their service for pre-ceremony and during cocktail hour which was a fitting for our beach wedding. The guests loved the unique, upbeat, yet relaxed vibe it brought to the day. Our friends and family were able to request classic fan favorite songs that everyone knew and were able to dance to, which really got the party started. I highly recommend using RythmTrial Steel Drum Band. Thank you for providing great steel drum music at our Yachty Gras at the Marina at Ortega Landing. Everyone loved it and it certainly made the mood. I look forward to having you play here again soon! When our dear friend lost his battle with cancer at age 42 we were left to grapple both with his loss and with his wish not to have a funeral or memorial service. Instead we decided to throw a party in celebration of his life, and his love of cruise vacations provided the theme for the evening. I was apprehensive about hiring a steel drum band because I didn’t want the occasion to be too over-the-top, or to seem disrespectful. When you came to set up and we discussed the situation I could tell immediately that you “got it”. We couldn’t have been more thrilled with your professionalism and with your sensitivity toward the occasion. You set exactly the right tone throughout the evening, giving us just the atmospheric cruise ship “pool deck” feel that we wanted, and that our friend would have greatly enjoyed. Thank you so much for making the entire evening extremely special for all of us! The Steel Drum performance was wonderful. Everyone thoroughly enjoyed it! Ephraim was great! One of the greatest fears with a destination wedding is hoping that everyone will come through. Ephraim was on time, professional and very entertaining for us and our guests. Having him was a unique addition to our wedding we will never forget, and we would highly recommend him to anyone. Everyone absolutely loved him! Again thank you so much for making our wedding a day we’ll never forget!! Ephraim thank you so much for playing during our wedding and also DJ for the reception!! Everyone had so much fun and are still talking about your talent!! It was an evening to remember! Eric and I would like to give you huge thanks for playing at our wedding 7/8/12. I personally appreciated you were on time and you played beautifully. My guests can’t stop talking about how much they enjoyed your music during the cocktail hour and later on when you played “Is This Love” for Eric and I alone as the sun set! It was a memory for a lifetime! Thank you so much for providing such a fabulous time at our wedding – the music was fantastic, fun and a surprise for our guests. I have always loved the sound of the steel drum but was not sure if it would work well in a wedding environment – once I heard you start I knew I had made the right choice. Your professionalism is a stand out in your business….planning and choosing music via email could have been a problem – with your group it was a pleasant surprise. I just want to thank Ephraim from RythmTrail for a job well done. He returned every phone call, replied to every email and was punctual on the day of our event. The music was absolutely perfect! I wouldn’t think twice about having him perform at another event. Thank you for making my special day extra special. We had one person on steel drums from RythmTrail for our family reunion at Tuckaway Shores Resort and couldn’t have been more pleased. Everyone enjoyed his music and he was extremely friendly and never hurried to leave at 9pm. I would highly recommend this group to anyone interested in steel drums for that tropical Caribbean ambiance. I can’t thank you enough for creating such a beautiful ambiance at the wedding. The music was so fun and amazing! Everyone loved the performance and it really made me so happy to walk down the aisle to such great music. It really was wonderful! Thank you so much! I will recommend you to anyone who would like beautiful music played at their wedding! Thank you again! We were *very* pleased with our whole RythmTrail experience. Our performer Lawrence called to confirm that he was on his way the day of -which gave us piece of mind. He was prompt, friendly and played a great variety of songs. The volume was perfect: the guests could converse comfortably and still enjoy the live music. It made for a wonderful event and we would highly recommend RythmTrail Steel Drum Band! We want to thank you for your outstanding service at our daughter’s wedding. You were prompt, courteous, and professional. We all truly enjoyed the music. My only regret is I should have asked if you would stay and extend your playing since it was enjoying and set the tone. Thanks so much and we loved the music. Found the artist very respectful, kind and courteous He was an excellent performer and really set the mood for our Luau theme party. He was set up to go almost an hour before he was supposed to, and started playing almost 30 mins before I had asked him to (which was a great thing). He was easy to work with, and knew all the songs I would have expected him to perform. He commanded a stage presence and was very friendly. I would definitely rehire Steel Drum Band RythmTrail for any other Beach/Caribbean themed party we ever have. Very professional company and easy to work with. Very good in staying in contact with there clients and the online automated system for placing a deposit and paying for the event is very simple and easy to use. What an amazing job! Everyone loved the steel drum!! Arrived to the venue early and was ready to perform. Fun & Professional and I will certainly book again for future events!! Thanks so Much! Ali from Steel Drum Band was the life of our party! Not only was his music delightful but his attitude was positive, and endearing. By the end of the day Ali was not just our source of entertainment he became our friend. We will definitely invite him to our next event! Ephraim, with RythmTrail Steel Drum Band, did a wonderful job performing at my son’s high school graduation party. Many guests were visiting from the North, and his music really helped to enhance the tropical theme!! In addition, the booking process was simple and he arrived early to set up and was very pleasant to all the guests. I had the pleasure of working with RythmTrail Steel Drum Band for the first time on October 1, 2013. I had booked the Trio and they were very professional, on time and went above and beyond the call of the contract. The bands stage area was switched 3 different times and Ephraim and the rest of the band were very accommodating with all the confusion. The band sounds great and has the Island Groove Sound! I would definitely use them again and again and thank you for a great night! Our event was a tremendous success and Loris at RythmTrail Steel Drum Band was fantastic. He arrived early and was set up in plenty of time. He played continuously and his music was perfect for the occasion. He was very professional. We won’t hesitate to use them again! We have utilized this band for a B-Day and Christmas Party and will definitely ask them to perform again. Their promptness, attitude and playing ability surpassed our expectations. Very entertaining! Kept the party going! Thanks! We hired the Steel Drum Band RythmTrail to perform at the Grand Opening of our new offices. Our performer arrived early to set up. His performance provided the perfect atmosphere! By the end of the evening, many of our guests were dancing along! His demeanor was professional and polite. We will definitely use their services again. Dear Ephraim Our international trade association members thoroughly enjoyed Rythm Trail’s 4-piece presentation of steel drum (pan) music spanning the Caribbean island nations. Your band received many compliments for the quality of your music, entertainment skills and professionalism. I am happy to provide excellent references and referrals for other business groups. Thanks again for a great job. Wanted to thank you again for the great job at our function. You guys are terrific! Please remember to let me know when you have your first CD ready for sale. I couldn’t have been happier with RythmTrail Steel Drum Band. They were so easy to work with, always responsive and the music was fantastic. Our guests loved them and we would definitely hire them again. Ephraim was great again. RythmTrail is always prompt in answering emails and questions, show up on time to set up, the payment and contract process is hassle free. Thanks again for a great show you make me look good in front of everyone. Ephraim thanks for great night at our new years eve party last night. Just what we wanted, our guest loved your music and we give your business cards to some of our neighbors so we hope to hear you and your guys again soon. Ephraim, thank you for the fabulous music at our event on Bonita Beach. It was the perfect evening for our beach party – gentle gulf breeze, great food and drinks and the sounds of the steel drums to add the finishing touch. Not knowing we had Ephraim himself, I asked what his name was so I could relate to Ephraim how much we enjoyed the entertainment. He just smiled and said “I am Ephraim”. RythmTrail is absolutely professional and courteous from the initial contact, to the contract and finally the performance. I will use RythmTrail again for our condo parties. Our Steel Drum Band travels everywhere to perform for any event. Beach Wedding, Corporate Event, House Party, Christmas & Holiday Parties and all other occasions. Georgia (GA) St Simons Island, Jekyll Island, Savannah, Atlanta and others. In South Carolina (SC), Hilton Head, Charleston and others. Anna Maria Island, Bonita Springs, Captiva Island, North Captiva, Cocoa Beach, Clearwater, Daytona Beach, Destin, Dunedin, Orlando, Winter Park, Kissimmee, Clermont, Tampa, Palm Harbor, Treasure Island, St. Pete, Sarasota, Sand Key, Siesta Key, Longboat Key, Ft. Myers, Naples, Marco Island, Florida Keys, Key West, Key Largo, Islamorada, Key Biscayne, Miami, Miami Beach, North Miami, South Beach, Fort Lauderdale, Singer Island, West Palm Beach, Palm Beach, Jupiter, Port St Lucie, Fort Pierce, Vero Beach, Melbourne, New Smyrna Beach, Ormond Beach, Palm Coast, St Augustine, Ponte Vedra Beach, Fernandina Beach, Jacksonville, Jacksonville Beach, Amelia Island, St George Island, Panama City, Pensacola, and Ocala Florida. 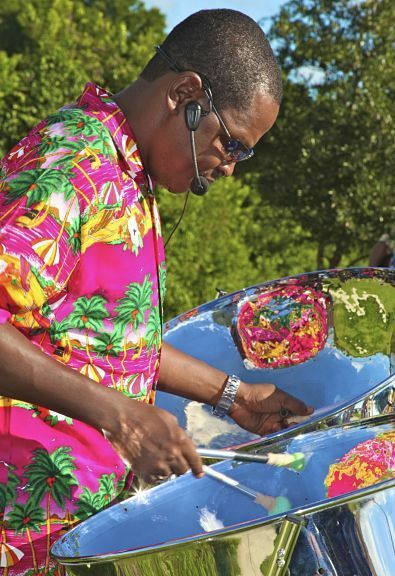 RythmTrail Steel Drum Band was formed in 2004 by fellow Steel Drum Player Ephraim Adams from Guyana. The band members are all Caribbean Island natives who lived the Island culture, music, the vibes and everything prior to migrating to the USA. All of our players have more than 20 years experience playing steel drums and performing the island music reggae and calypso. RythmTrail Steel Drum Band plays at over 300 events. When you are planning any event be it a Beach Wedding, Wedding Cocktail or Ceremony, Corporate Function etc and you decide to contact RythmTrail Steel Drum Band you would not find some booking agent or event planner taking your call, you will be speaking with an actual steel drum player Ephraim Adams. I know exactly what you are looking for at your event, I know the kind of ambience you want to create, I know the kind of energy you want to bring to you party, corporate event or wedding because I (Ephraim Adams) am a steel drum player myself. Not just some guy with a website hiring random steel drum players or performers. Since I am an actual steel drum players myself I listen to you or read your request personally and know exactly which player best fits your event. It’s not one size fits all because each event is different. Some events are just laid back easy listening while some are upbeat high energy and very engaging. So I know who is the best player or the best group of performers to send to your event to make it a success. Read hundreds reviews from clients just like you on these pages. What Steel Drum Band size best fits your event? We offer band sizes from solo act to as large as a nine piece band size or more, whatever the needs for your event RythmTrail Steel Drum Band will deliver. Solo Steel Drum Players for small beach wedding, cocktail hr, just a small house party or grand openings, bachelorette parties etc. Our steel drum players are from some of these Caribbean Islands: Guyana, Jamaica, St Croix, St Thomas, Trinidad and Tobago just to name a few. Solo performances are done with backing tracks some also include vocals depending upon client request. Some of our solo steel drum performances are exclusively the steel drums only without any backing tracks or vocals only when specifically requested by the client. Our Duo Act band composition are Two steel drum player, a steel drum player with a guitarist or a steel drum player / steel pan player with a percussionist. The duo band include vocals unless request for instrumental only by the client. We provide Live steel drum music and Caribbean Entertainment for rehearsal dinners, pool parties, birthday parties, graduation parties, grand openings, baby showers, fundraisers and more. Our Trio Steel Drum Band composition are Two steel drum players and one guitarist, two steel drum players and one percussionist, one steel drum player a guitarist and a percussionist OR three steel drum players. All band compositions include vocals and only excluded by client request. Our Trio Steel Drum Band act are usually for large events and budgets. We perform at conventions, corporate events, bar mitzvahs, house parties, Christmas parties, holiday parties (4th of July etc), cruise ships, retirement communities events, retirement parties, business anniversary and more. Our Four Piece Steel Drum Band compositions are Two steel drum players one guitarist and one percussionist, three steel drum players with one guitarist or one percussionist OR one steel drum player one guitarist one percussionist and one keyboard player. All band compositions include vocals unless excluded by the client. Four piece steel drum band are for large weddings, sorority functions, anniversaries, bachelor parties, engagement parties, bridal showers, fraternity events, family reunions, class reunions, christenings and all occasions. Moko Jumbies – Stilt Dancers also know as Stilt Walkers, Our Moko Jumbies (Caribbean Stilt Walkers) put on an actual dance performance and your event. They just don’t stand around, they are real high energy performers. If you want to get your party going then our moko jumbies is the act for you. Junkanoo Band – More energy for your event with color costumes, whistles, bells, horns and drums that shake the earth our Junkanoo band could wake up any party or event. We have the best lead dancer in the business a girl full of energy and bacchanal in her waistline. Carnival Girls – Colorful energetic, Caribbean dance moves, smiling faces and more. These Carnival Girls would make your party the talk of the town. Perfect for party hosting, getting your dance floor going and some great photo ops. Brazilian Dancers / Brazilian Girls – We can take you to the heart of Rio de Janeiro Brazil, Fun, wild and crazy ok not too crazy but just pure fun and high energy. These girls with colorful costumes, big feathered head wear and fun music will bring any party or event to life. All authentic Brazilians. Fire Performer – Just add little wow factor to your event. Fire performers do tricks such as fire eating, limbo under a burning stick etc. Though all our musicians are very versatile and could play music across all genre pop, top 40, jazz etc. We at RythmTrail Steel Drum Band keep it specifically Island Caribbean music. We understand that if you hire a steel drum band or steel drum player you want something different, you want the Caribbean feel, the Island vibes so we play mainly reggae, soca, calypso, some jimmy buffet just pure Caribbean Island music. After all you did not hire a DJ or top 40 band, you hired steel drums for the happy island sounds of the Caribbean and that’s what we play at your event Caribbean Island Music. Our steel drum band will be jamming in Longwood Florida tonight for a surprise birthday party. The best steel drum for wedding, parties & events in Longwood. Busy gig day for RythmTrail Steel Drum BandEight events TODAY Nov 5 2016:At Lilly Pulitzer Sarasota FL store at the Mall at University Town Center from 2-5 pm. | Lilly Pulitzer International Plaza Tampa FL - 12:00 noon to 3:00 PM | Lilly Pulitzer St Armands Circle Park Sarasota FL - 3:00 PM to 6:00 PM | Wedding cocktail hour reception in Sarasota FL. | Bar Mitzvah in Delray Beach FL | At The Royal Palms in Fort Lauderdale FL for a cocktail hour reception. | In Atlantic Beach Florida, beach wedding ceremony and cocktail hour reception. | Ormond Beach FL tonight Nov 5 2016, 60th birthday party. Our steel drum band will be playing in Boca Raton FL for a Convention Rehearsal Dinner in Sarasota FL. Party in Apollo Beach and West Palm Beach FL Our Junkanoo Band will also be on show in Hollywood Florida. Our steel drum band will be jammin at a party in Ponte Vedra Beach (St Johns County) and a corporate reception in Orlando FL at World Center Marriott tonight.Book the best steel drum players for your wedding, party and corporate function. Our steel drum players will be jammin in Clearwater Beach Florida today for a beach wedding ceremony and reception at the Hyatt. Book the best steel drum band for beach weddings in Clearwater FL. Today our steel drum players will be playing at a birthday party in Silver Springs FL, Marion County and a Caribbean Luau Party in Lake Mary Florida at Oakmonte Village Cordova. Our steel drum band will be playing at the End of Summer event this morning at Harbourside Place, Jupiter FL and tonight we are jammin in Miami FL for a birthday party. Book the best steel drum players for your event. Live steel drum band performances today in Destin FL for a beach wedding ceremony and birthday party in Miami FL. Hire the best steel drum players for your events in Florida, Georgia, SC, NC and Alabama. Today we will playing in Naples FL. for a corporate reception and our steel drum player will also be jammin at a house party in Tampa Florida. Steel Drum Band, Steel Drum Musician. Our Steel Drum player will also be jammin at a black and white affair. Birthday Party bash in Royal Palm Beach FL. Live steel drum music, the life of the party, wedding or corporate events in West Palm Beach Florida area. Our Steel Drum Band will be playing at the Miami International Boat Show tonight on Collins Ave, Miami Beach. Come out to the biggest boat show and enjoy the sounds of live steel drum music by RythmTrail. Our steel drum players will be jammin for Kadey Krogen Yachts. The best steel drum entertainment in Miami and South Florida. Live steel drum music today at the Hilton in Daytona Beach Fl. The steel drum players will be playing the corporate reception before the dinner. Also our Moko Jumbies, stilt walkers and stilt dancers will be doing a performance to lead guest to the dinner area. The best in steel drum music and Caribbean, Island theme entertainment. Our steel drum band will be playing at a corporate function in Miami Florida tonight. RythmTrail steel drum players will also be in Naples FL. tonight for a community event (cocktail reception party) Moorings Park at Grey Oaks. Hire steel drum music for corporate functions, receptions and community events in Florida. Our steel drum players are playing at weddings and events in Winter Garden FL, Jackaonville FL & Miami Florida this week. Hire the best steel drum band & players for beach weddings and events everywhere. The Steel Drum Band will be jammin at a New Years Eve Party today in Tavares Florida and our steel drum players will be playing at another party tonight in Boca Raton FL. Usher in the New Year with island music vibes, live steel drum music, reggae, soca and calypso. Book the best steel drum players in the business for Community Events, Conventions, Festival events, campus events, graduation parties, trade show events, beach weddings and more. Our steel drum players will be jammin live steel drum music at a holiday Christmas party tonight in Bradenton Florida. Book the best steelpan players for beach weddings, private parties, corporate functions, anniversary party, baby shower, wedding rehearsal dinner and more in Bradenton FL and Countrywide. The best steel drum music you’ll ever hear.